Mark Twain was born Samuel Langhorne Clemens in Florida, Missouri. 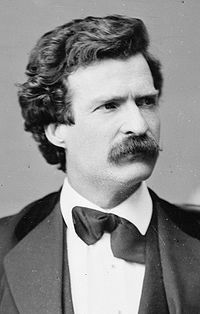 Following careers as a printer, Mississippi riverboat pilot, and a brief stint in the Confederate militia, Twain wrote such American classics as" The Adventures of Tom Sawyer," "The Adventures of Huckleberry Finn" and "A Connecticut Yankee in King Arthur's Court." The following is a personality profile of Mark Twain based on his work. Mark Twain is unconventional and boisterous. He is laid-back, he appreciates a relaxed pace in life. He is intermittent as well: he has a hard time sticking with difficult tasks for a long period of time. But, Mark Twain is also empathetic: he feels what others feel and is compassionate towards them. This book is a great read. Twain is undoubtedly the premier wordsmith of America. I had to read this book slowly in order to catch all of the subtle humor, ironies and sarcasm.